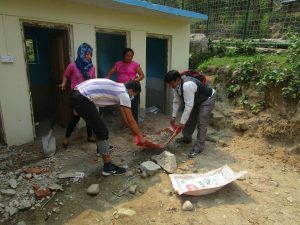 On 8th May, 2017, NJSI formed a team and went to Tupche 2, Nuwakot, at Shree Chandeshowari Higher Secondary School to mobilize the local people for bettering the hostel environment by cleaning the vicinity. NJSI has constructed the hostel for visually impaired children at Tupche, Nuwakot which can accommodate 20 students. It has separate living rooms for girls and boys, a kitchen, a study room, two toilets and two bathrooms. There were altogether 13 participants for the site clearance. 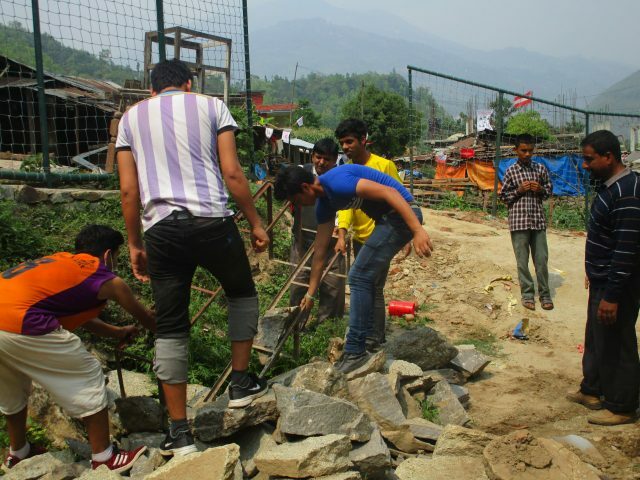 The team cleaned rooms, rearranged the scattered materials, cleared the debris and leveled the ground. The program went well with the help of local people. The purpose of the team was to make maximum participation of the local people and make them aware of their responsibilities. To some extended this event has made the local people realize the importance of the team work. The local people were very happy to work as a team and asked for further programs and events that motivate them to work together for the upliftment of their community.